Fall is here, so we’re getting into gear! Research has shown that, aside from the physical benefits of regular exercise, working out can benefit memory, concentration, and creativity. To that, NHA has two after-school clubs that encourage students to physically and mentally improve. In Yardley, gym teacher Mark Beuerle will be conducting Runner’s Club every Monday and Wednesday at 3pm to (no later than) 4:30pm. The group will run anywhere between 2.3 miles to 5 miles. 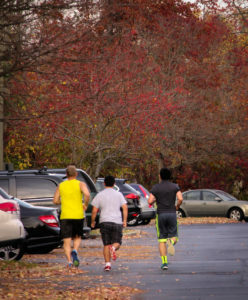 If the weather is uncooperative, the group will run at the Fairless Hills YMCA. In Doylestown, gym teacher Matt Mutek will be doing Fitness Club featuring weight training and cardio exercises on Wednesdays. Fitness sessions will be held at the school or at the Doylestown YMCA. Transportation to and from the facilities will be provided. However, students must be picked up from the school by a parent or guardian. To join either of these clubs, students should see Mark or Matt for parental permission slips.